Ceiling Queen Technology and Environment – friendly Green Building Material are the vigorously developing of new scientific technology in the modern age, the substances and products created have a fantastic feature and exceptional special function that is incomparable by traditional technology. Our company has committed ourselves to the core applications of negative ion, far infrared and photo catalyst technology; we have developed a number of negative ion and far infrared multi function gypsum ceilings which fulfill green building standard for internal building purpose. Ceiling Queen Energy Board series are using the latest Japan, Korea and Taiwan’s negative ion, far infrared and photo catalyst technology which arouses Molecule resonance within the human cells, promoting blood circulation and metabolism, not only anti bacteria/virus in the air but also provide us a fresh and high quality environment with air Vitamin negative ion. Our Ceiling Queen Energy Board series are made of natural rock materials as the new favourite in the worldwide environment protection vogue. 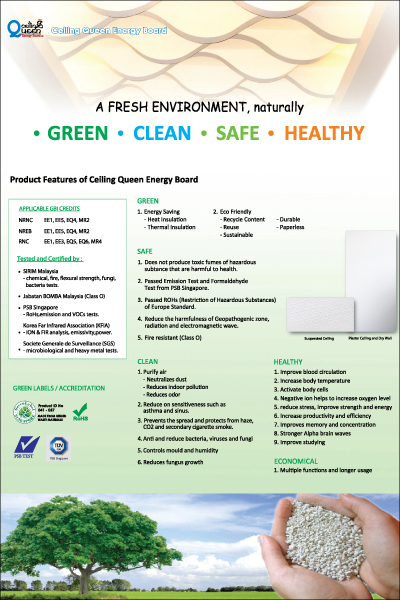 Without using electricity or others energy supply, our Ceiling Queen Energy board series may work as ionizer or air purifier to produce abundant Negative ionic air (oxygen) to every corner of our home, office, hospital, restaurant and other places, we may enjoy clean and fresh high quality air like staying beside forest, seashore, water fall and countryside.